Posters print out 8 1/2 by 11 size. This link is for 4 posters on one page. 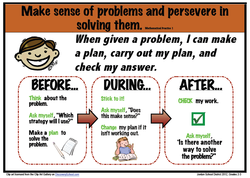 Click on the image to see another look at the mathematical practices. 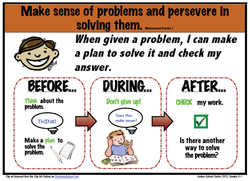 What should the mathematical practices look like during instruction? 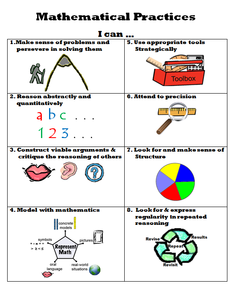 Click on the image for a document to help identify the mathematical practices during lessons. 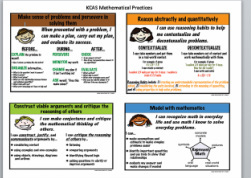 The standards for mathematical practices are the same for K-12 grade. 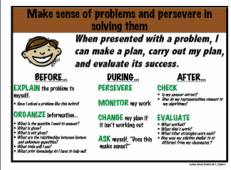 Many times teachers need to know "How do I teach practice #1 at my grade level. The links below will give you grade level looks at the practice standards.